Event Description: In a world of sermon podcasts, live-streamed messages and online churches, is there still a need to be involved in a local church? Is the church still relevant today? The Bible says absolutely yes! 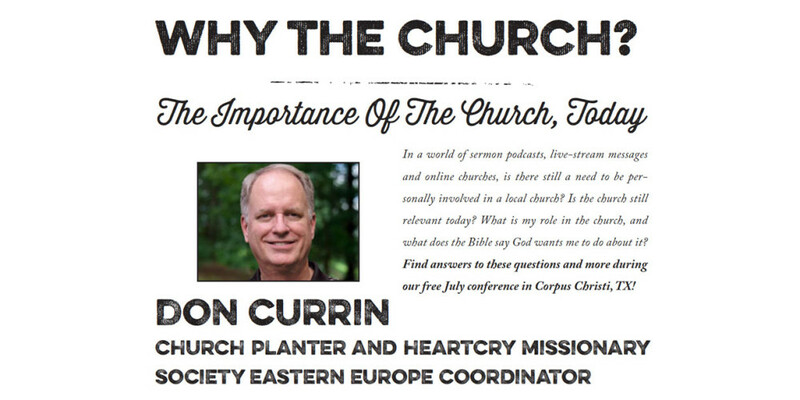 Find out why at our conference with church planter and HeartCry Eastern Europe missions coordinator Don Currin who will be speaking at 5 sessions over the weekend. Registration: This event is free for all conference attendees, but please register so we know how much food to prepare for the fellowship meals on Saturday and Sunday, thanks! Stay Updated: Latest Conference Info At Sermon Audio!